To create Tux, I downloaded a picture of Tux and opened it in Photoshop. After searching around the web for ways to move from picture to brick, I found ways to do it and got to work. I resized the width of my picture to 440 pixels and used the mosaic filter to create a mosaic with a cell size of 10 squares. I then displayed a grid with the grid lines set to 10 pixel squares to make it easier to see the squares. The final step was to change to indexed color mode and reduce the palette down to black, white and yellow to only display the colors I was going to be building with. Once the Photoshopped diagram was done, it was time to build. While looking at the design, I felt that the left eye didn’t have enough white around the black iris, so I extended the entire design one pixel wider to accommodate the design I wanted in the end. 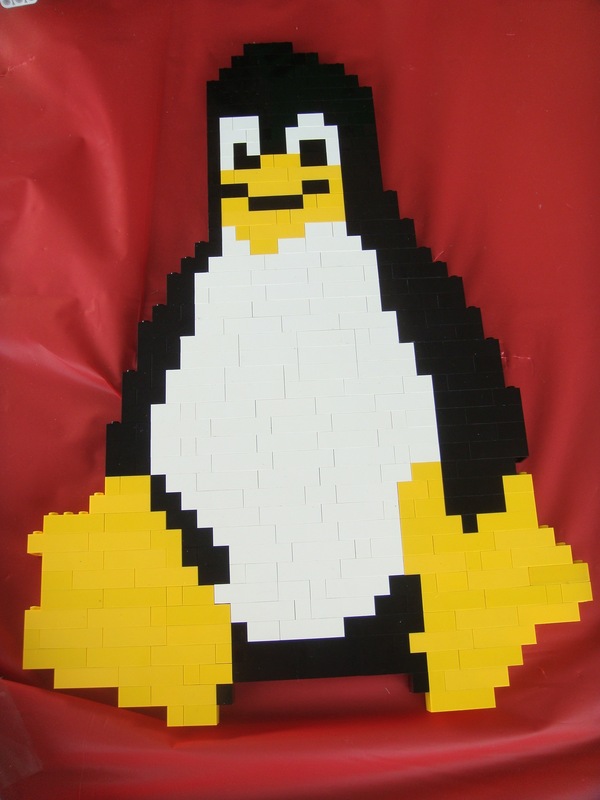 When building was complete, a two dimensional representation of everyone’s favorite Linux mascot was standing tall at 16 inches and was ready to display at the Maker Faire. Although Tux could not be stood up to display at the World Maker Faire due to the winds that regularly whipped through the tent, he was well received by all who saw him. Tux also is the perfect piece to lead into a series of sculptures I would like to start doing and look forward to creating in the near future.